She ascended with joy to heavenly mansions. This bright star of compassion arose in the dark days of the Turkish occupation to shed God’s mercy upon the oppressed people of Athens and to guide many endangered souls onto the path of righteousness. 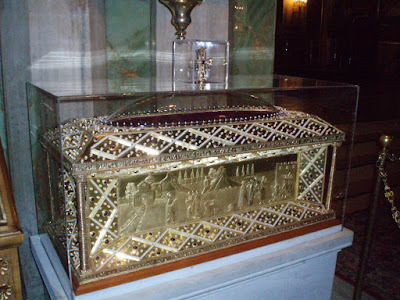 Her birth in 1528 into the aristocratic Venizelou family was seen as a miraculous answer to her mother’s prayers of many years. Even as a child, she showed a remarkable inclination for the life of ascesis and contemplation. However, as a sought-after heiress, she was married against her inclination at the age of twelve to a harsh, violent man whose moods and ill-treatment of her she bore with patience, while praying for his change of heart. After three years, the death of her tyrannical husband freed her from the bonds of matrimony and, despite the urging of her kinsfolk, she would not consider a second marriage, but entirely devoted herself to pleasing the Lord by prayer and fasting, while remaining under her parents’ roof. 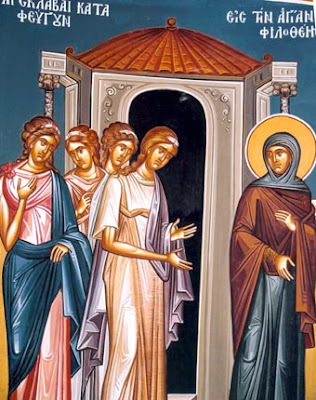 On their death ten years later, she used the whole of her great fortune to found a convent according to directions given to her in a vision by the holy Apostle Andrew, to whom the house was dedicated. [This monastery was situated on the site of the present Cathedral (Metropolis) of Athens.] 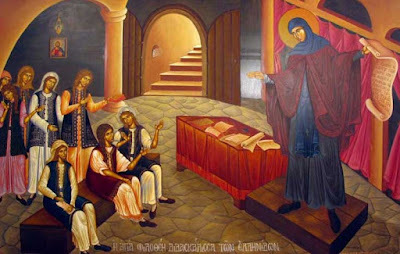 Not only did she see to the construction of cells and of all the other buildings that a monastery needs, but she also founded a whole range of charitable institutions alongside it: a hospital, hospices for the poor and the aged, various workshops and, above all, schools where the girls and boys of Athens could receive a Christian education. 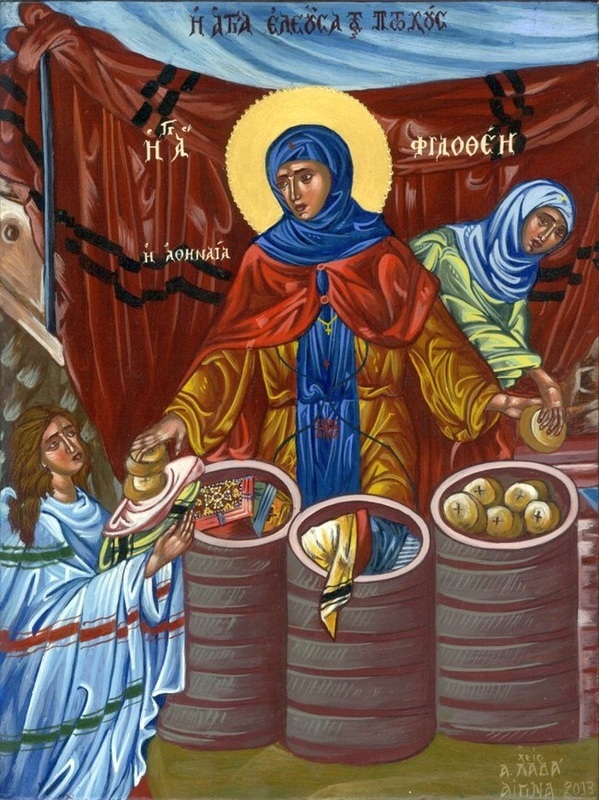 To support the monastery and its associated institutions, she provided an endowment of landed estates and dependencies (metochia), which also enabled alms to be distributed on a generous scale. 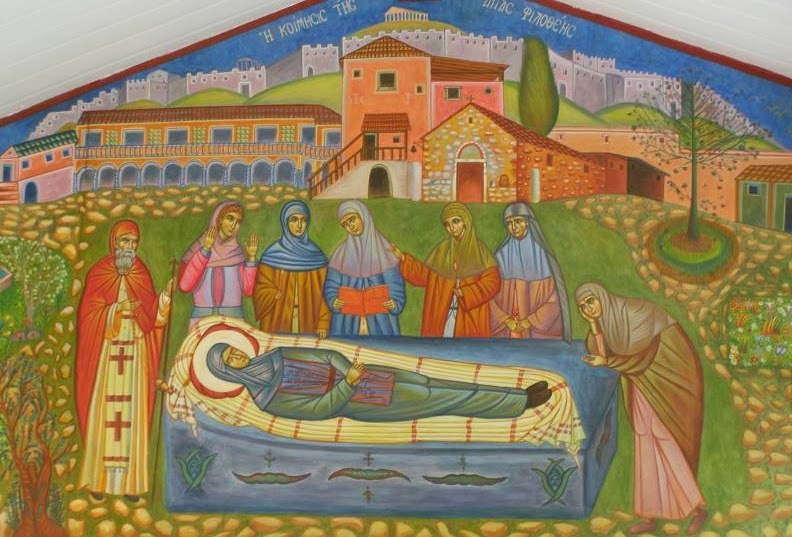 Philothei’s monastery thus soon became for Athens a source of heavenly blessings, a haven for the afflicted and a focus for the revival of the tradition of the Greek people. 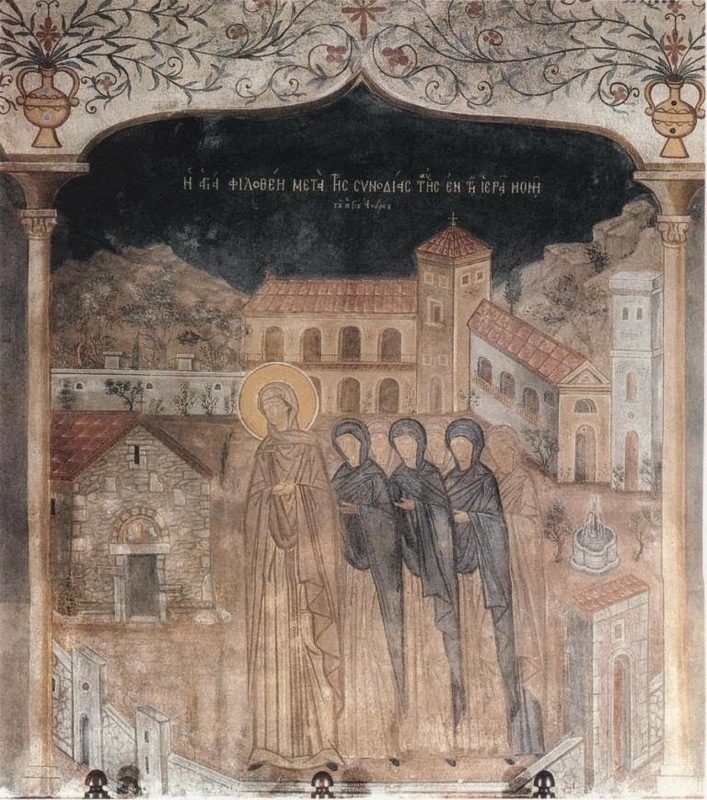 As soon as the first monastic buildings were ready, she took the veil under the name of Philothei, together with her maidservants, and a large number of other young women of different ranks in society, who had turned from the allurements of worldliness to set out, under Philothei’s direction, on the narrow way which leads to the Kingdom of Heaven. They were all of one mind in seeking to imitate the virtues of their spiritual mother. She had no equal in charity and compassion for the poor and the infirm, whom she visited and tended. 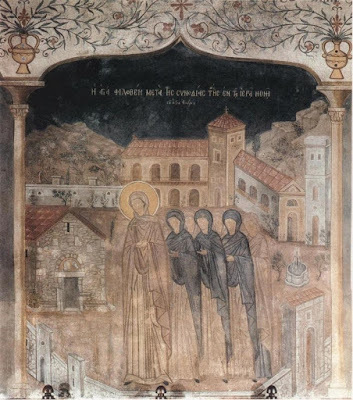 Since she gave alms without calculation the convent was, on one occasion, reduced to the last extremity, and some sisters began to complain about her. However, a few days later two gentlemen made a large donation, which saved the community from going hungry. 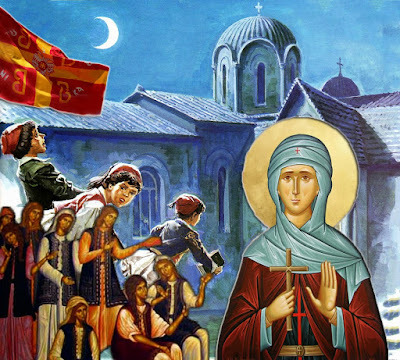 Her faith and compassion led Saint Philothei to offer asylum in the convent to Christian bondwomen who fled from their masters’ houses in order to preserve their faith and chastity. As a consequence, the Turks surrounded the convent, pounced on Philothea like wild beasts and, regardless of the fact that she was ill, haled her before the judge, who had her confined in a dark prison cell. When she was called on to deny Christ or to suffer death, she acknowledged with great joy that her dearest wish was to fulfill her martyrdom for the love of Christ. However, such was not the will of God and, through the good offices of some Greek notables in the city, she was released. Strengthened by this trial, she resumed her apostolic activity and ascetic labors with redoubled zeal. Having attained to perfection, she acquired the grace of working miracles and healings. So many were the disciples who wanted to join her that she had to establish a second monastery. There was a small cave in its grounds, to which she loved to withdraw for the sake of contemplation. Her influence among the people aroused the hatred of the Turks. 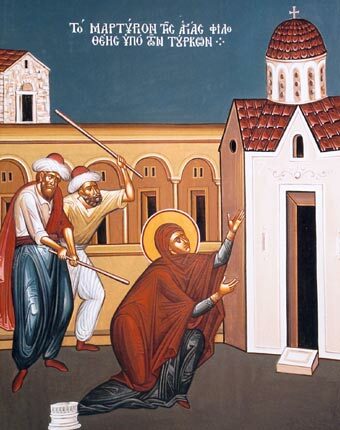 One night, they broke into the new monastery during a vigil, and cudgeled the Saint so violently that she was left half-dead on the ground. She bore the effects of her injuries with wonderful patience, and gave back her martyred soul to the Lord on 19 February 1589. Scarcely twenty days had passed before a lovely scent began to issue from her tomb. 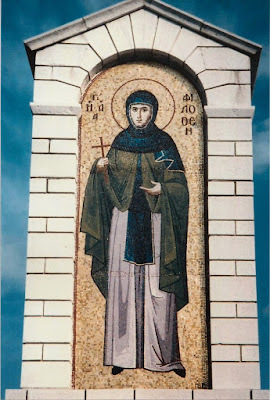 Not many years later she was officially recognized as a Saint of the Church. Her honorable relic, which is venerated to this day in the Cathedral of Athens, has remained incorrupt for the glory of God and the consolation of the Christian people. 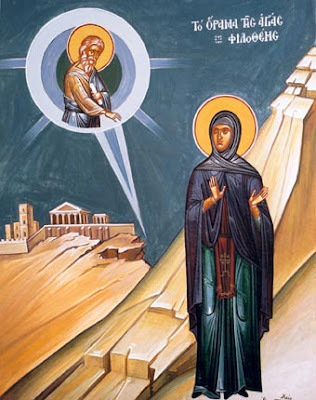 Together with Saint Dionysius the Areopagite and Saint Hierotheos, she is considered the Patron Saint of Athens. 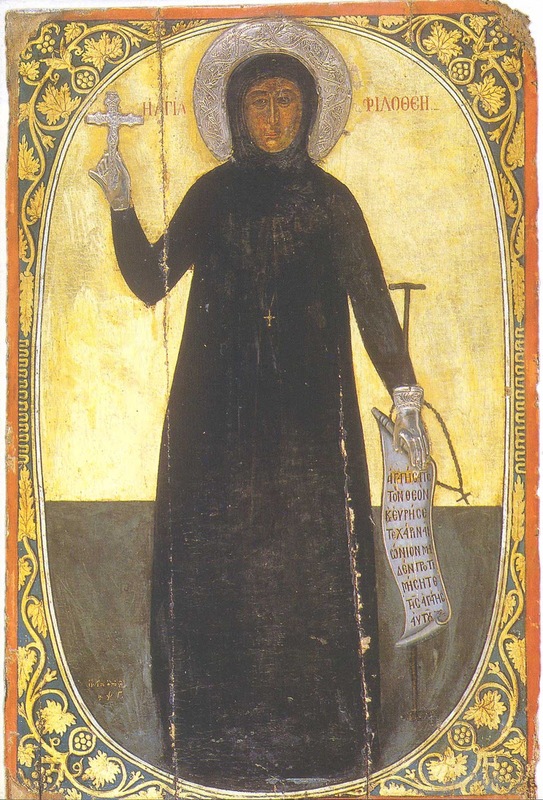 Sometimes she is also called Saint Philothea. From The Synaxarion: The Lives of the Saints of the Orthodox Church, Volume 3: January, February by Hieromonk Makarios of Simonos Petra, translated from the French by Christopher Hookway, Holy Convent of The Annunciation of Our Lady Ormylia (Chalkidike), 2001. The famed city of Athens doth honour Philothei, the Venerable Martyr, whose relics it now revereth with joy; for while living in sobriety and holiness, she hath exchanged all earthly things, for everlasting life through great contests as a Martyr; and she entreateth the Saviour to grant His mercy unto all of us. We all honour Philothei with jubilation of Spirit, as this day we rev’rently worship her ven’rable relics. For she lived her whole life working kindness and mercy; and the venerable one, receiving a martyr’s ending, is deemed worthy to entreat God, that all be granted eternal life with the Saints.